Fun and excitement is fostered by great lessons and hands-on experiments. The Young Scientist Camp covers a broad range of fun and exciting science topics in Chemistry, Earth Science, Life Science, Physical Science, and Lab Process Skills. 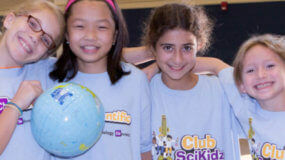 It is by far our most popular summer science camp experience in this age category. Your camper will enjoy the 20 make-and-take projects, and that makes for a fantastic STEM summer! Grow – Beast Experiment! Wacky Window Paint! Super Bouncing Balls! Cosmic Rocket! Wurmz and Dirt! Diving Submarines!